This is the first full length, Spanish animated film I’ve seen. That being said, I really enjoyed it. The art, the way it flowed. It seemed simple with it’s strong black lines, but you got real emotion from the characters and the story line. 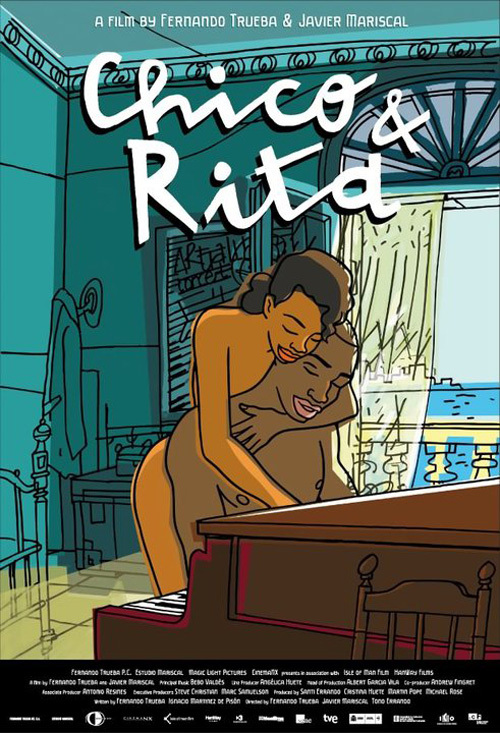 The film focuses on two main characters, Chico and Rita. Chico is a young, dashing man with hopes of being a famous pianist. Rita is the beautiful singer, who is easily impressing everyone she sees. They’re both connected by their love of Bolero and whatever you want to call that connects them emotionally. Romance? Havana, Cuba is the backdrop. You’ve got it right when Havana was the place to be- 1948. Tons of Americans coming to visit and party. Chico and his friend, Ramon where bumming around with some pretty american girls. Going from club to club, enjoying the evening. Musicians at one of the bars, step up and start playing and guess who is the lead singer? Why Rita. Chico is taken back by her, and he wishes to talk to her. It doesn’t happen because she’s being distracted by an American Man. Ramon and Chico then move on to another club. They sneak in, and as luck would have it, the pianist for the evenings band is missing. Someone overhears that Chico is an accomplished pianist and he ends up impressing everyone, including the band. Rita is impressed and agrees to ditch her date. They flee the scene on motorbike with a connected sidecar. Awaken the next day by a composition Chico wrote for her, and named after her- they have a few moments of bliss. Later destroyed by an ex-girlfriend coming in and messing it up. Rita leaves offended and that’s the start of their rocky relationship. Through out the film, you see the slow road to fame for the two. Starting with a radio contest which leads them to New York, Las Vegas and even Paris. But this is all not without great difficulty and meddling men/jealousy. Which I feel always ends the same way for the pretty ladies. I enjoyed this film for it’s unconventional story of romance. It wasn’t one straight line, it was a mess. I also enjoyed watching it in Spanish, it’s a film culture I’m not well connected to and would definitely would love to learn more about. The music and art shined through and in a real way. You never felt there was a lack of it or, even too much. Real music for a good story. I don’t know if that made sense, but it was a good level. Trust me.